Happy Tuesday everyone!! It's been a long week but I am so happy I am back to putting my recipes up. 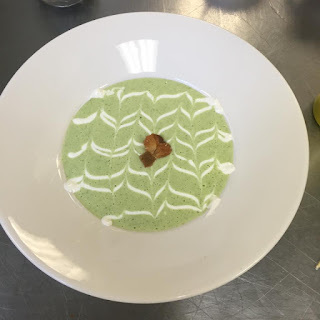 So today, I would like to do a spin on my famous cream of broccoli soup. I like making it for Thanksgiving, but it can be made at any time. So there are some things we will need to alter. So, for some odd reason, some recipes like to use chicken broth for their cream of broccoli soup. I have never used it for any reason in a cream of whatever soup I have made. Instead of butter, I used olive oil, and instead of heavy cream, I just use soy milk. I can't really taste much of a difference from this recipe compared to the original. Also, some will just throw the broccoli in with everything else and sometimes the cream of broccoli soup turns kind of brownish or a really gross green color. What I usually do is I blanch my broccoli first (put it in boiling water for 15-30 seconds) and then I instantly shock it (throwing it in an ice bath) to halt the cooking process. In this sense, what will happen is you are cooking the broccoli so it is not raw, but it is soft enough to blend with no issues, and then once it is put in the ice bath, it does not only stop the cooking process, but it gives it more of a pretty greenish color (you will see in the pictures below. :)) I hope y'all enjoy it and have a great rest of the week! Heat olive oil in a saucepan over medium heat. Add onions and cook until translucent (kind of see through, about 10 minutes, be careful not to brown them too much). Add celery and garlic and cook for an additional 3-5 minutes. Add the potatoes and 3 cups of water to the pot. (You can always add a little more depending) and a teaspoon of salt. Bring the water to a boil. Once it is boiling, reduce it back to a simmer and cover the pot until the potatoes are fork tender. This can range between 10-20 minutes depending on the cuts, and the stove. I would just make sure to check it). Get another pot, put in 4 cups of water. Salt it like the sea!!!!!! Throw your chopped broccoli in for 15-30 seconds or until it is fork-tender. (if you need to do it in batches, that's fine too. I recommend doing that so they can all cook evenly). Make sure you have your ice bath ready (just a bowl with water and ice), and once your broccoli is fork-tender, use a slotted spoon, or a colander to separate the broccoli from the boiling hot water and insert the broccoli into the ice bath. Transfer EVERYTHING except the water from the ice bath into a blender, add your soy milk, seasonings and puree it until smooth. (if you have both, I would advise using an immersion blender afterward to smooth it out even more, but either one will work just fine!). It is ready to be plated. If you want to add a design on it, you most certainly can. Usually, people use a combination of sour cream and milk, but you can certainly use vegan substitutes as well, and then some croutons on top. And there you have it! 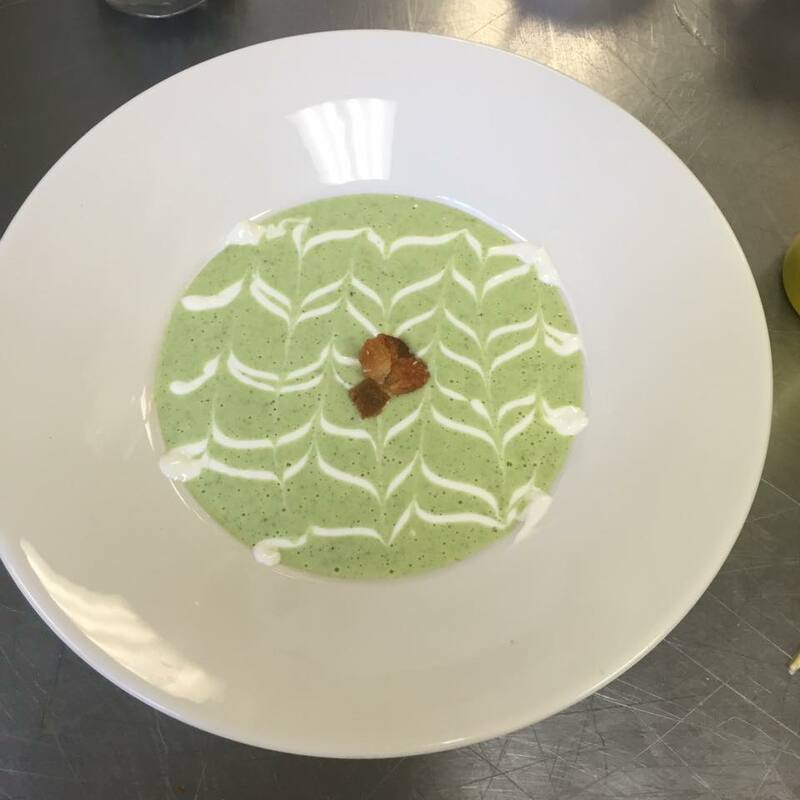 Below are pictures of when I had made the soup during class, Thanksgiving, and one was also when I made vegan cream of mushroom soup. You can really see how bright the colors are for these. Thanks for reading!! Try it at home and let me know what you think!! This looks nice a creamy! It seems easy to make also. I would love to try this on a cold winter day to warm me up. Great recipe! This sounds really nice! I am keeping this recipe to try it for my kids. I have one who just looooves soup! It looks so delicious! Great pictures too! I saved the recipe and I'm gonna try it soon! I'm not a vegetarian, but this looks good. I may have to try this recipe. Broccoli good, cream good, soup goooood! I've been getting a lot of vegan recipes from your blog. I just wish I had such recipes many years ago when I was vegan. During the fall and winter, I love to make fresh soups at home. This cream of broccoli will be a perfect addition to our meal plan. Broccoli soup itself is very delicious and Vegan Cream of Broccoli Soup would be a mesmerizing dish. The ingredients included garlic, potatoes etc.